When Jennifer Lewis and her husband, Adam, bought their Normaltown house 16 years ago, the neighborhood wasn’t the hip area it is today. It had the basics, some of which still exist like Normal Hardware, but Lewis said the neighborhood needed some TLC with a preservationist’s eye. “Being a historic preservationist, I could see the potential,” she said. The couple bought a fixer-upper, dug into the neighborhood and have been there ever since. And now, her part of town is one of the most sought-after markets in Athens. Lewis, a graduate of the College of Environment and Design’s historic preservation master’s program, coordinates the public service and outreach office of the college with its director and Lewis’ mentor, Pratt Cassity. As the outreach coordinator for CED, Lewis acts as the self-described “air traffic controller” for the public service arm of the college by finding homes for community service projects. 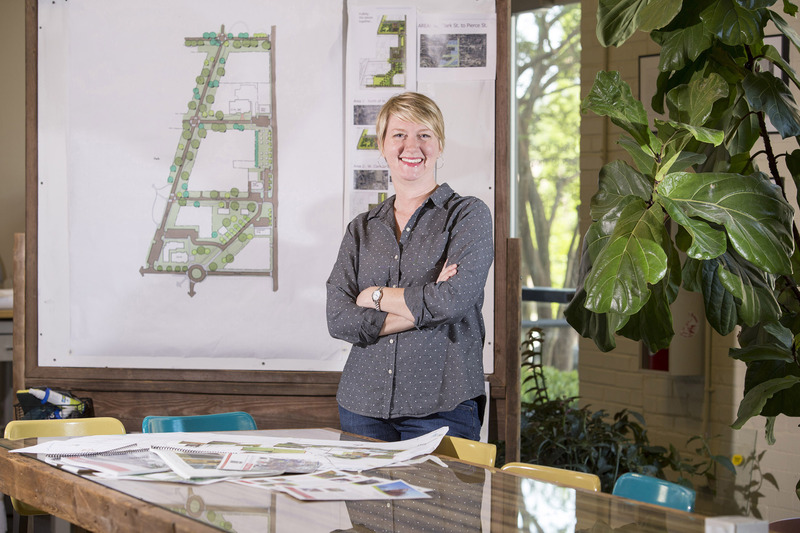 She details the scope of design problems and then pairs students with individual smaller projects, like backyard erosion for a property owner, or classes with projects, like highway beautification or community trail design or faculty with projects that match their research interests. “Our college has a long history of doing real-world projects as part of our studios and our classes, and we like to give our students a practical application for what they are learning,” she said. Lewis also plans CED’s design charrettes, a nontraditional service-learning course that’s run more like an interactive field trip than a class. The course is a brainstorming and application workshop that gets students on the ground, face to face with real-life community design problems. The charrettes embody experiential learning and outreach extension, two university ideals that have long been practiced at CED. Charrettes pair design experts—CED students and faculty—with community members trying to solve a design problem. One recent charrette designed a series of boat launches along the North Oconee River that could connect to the North Oconee River Greenway trail and campus. Another partnered with Georgia Tech’s architecture studio to design Camp Hooray in Jackson County, a fully accessible overnight camp for people with developmental disabilities. Lewis knows how valuable the experience is to students, not only for finding a job after graduation, but also for learning to incorporate sustainable design into communities. She said the charrettes equally provide vital resources to smaller Georgia communities that otherwise wouldn’t have access to public design experts.